I have an awful habit of over-packing. Three-day road trip? We’ll probably need a crockpot and 20 pounds of rib eye steak, right? 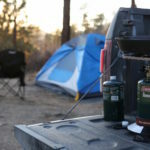 Admittedly, being underprepared is worse – a friend almost froze to death in the high desert without a sleeping bag and insulation from the frigid ground. He owes his life to the industrial strength heaters in his ’04 Wrangler (and has since invested in proper gear). One day I’d like to gauge my travel needs perfectly — but not yet. 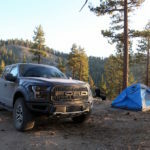 Had I been a packing scientist, I wouldn’t have chosen the 2017 Ford F-150 Raptor for a recent camping trip to Big Bear, CA (and that would have been a mistake). 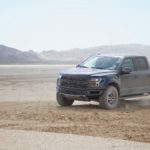 In many ways, the second generation Raptor is the vehicular equivalent of over packing: it can sail through the desert at 100 mph, scamper up the side of a mountain, leap over sand dunes, and run a 1,000-mile off-road race without modification. Overkill for a weekend camping trip? Definitely. It’s also one of the most empowering vehicles I’ve ever driven. 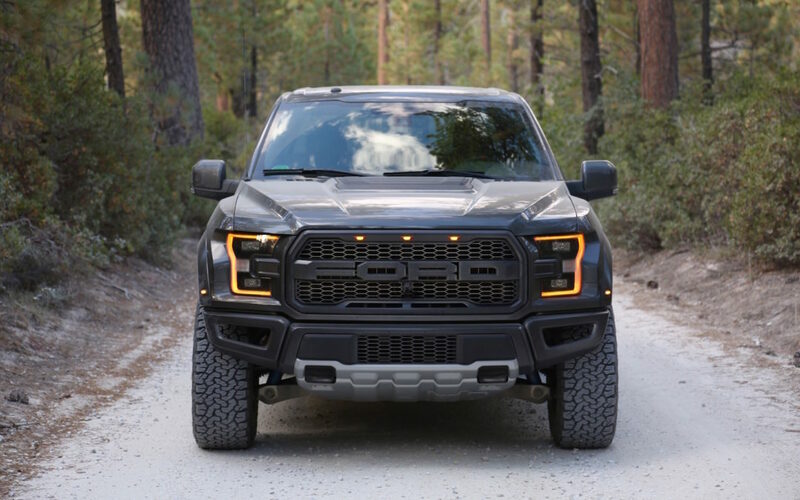 450 horsepower and 510 pound-feet of torque move 5,600 pounds quicker than most muscle cars. Beefy Fox Shox provide 13-inches of front suspension travel and absorb tremendous punishment without flinching. 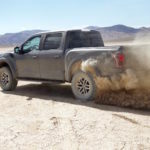 Knobby BFGoodrich KO tires never struggle for traction – unless provoked in a truly badass desert drifting display (more on that later). 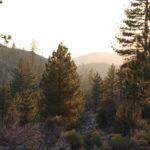 The route to our campsite involves four miles of what I’d consider civilian access (your mom’s Camry would manage), seven miles of high clearance terrain, and two miles of challenging trails. 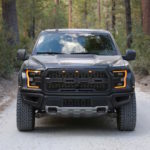 During past visits to the site, I’ve driven a Toyota Tacoma TRD, 4Runner TRD Pro, and RAM Rebel – all thoroughly capable rigs. None of them made the journey as quickly or as effortlessly as the Raptor. 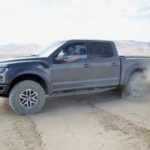 More astounding than the super-truck’s vigor is its precision. 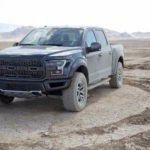 Placing the big-bodied pickup on a narrow mountain trail is as natural as pummeling sand in the open desert. In just an hour, my mate and I ascend Big Bear and begin unpacking. 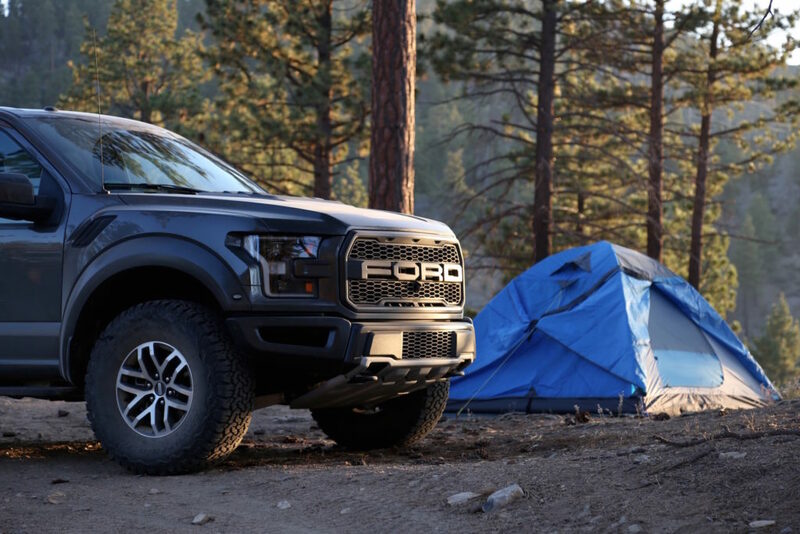 Thanks to the Raptor’s cavernous SuperCrew rear cab, all our gear and provisions remain cool and dust-free. 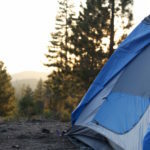 Typically, I view camping as a chance to break from technology and amenity, but with two A/C power ports, I’m sheepishly inflating an air mattress and boiling water via wired devices. Our phenomenal pace to the campsite means we’ve set up the tent and prepped dinner before sunset. Watching the sun descend over a ridge of forested mounts, shading the sky in a peach-colored glow, I feel no regret for having chosen such a competent rig. 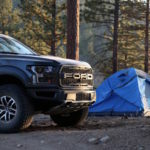 As the last ounce of golden light fades, the Raptor continues to prove its worth with in-bed LEDs to illuminate our preparations for sleep. 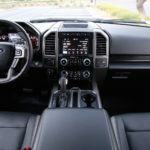 At this point, I half expect the truck to include a warm milk dispenser. Before I can dream up other terrible camping innovations, a wave of fatigue hits and I make a beeline for bed. We rise early, ignite the stove, and eat our breakfast in silence. The fresh, chilled air is more rousing than coffee – but caffeine addictions demand a full cup of brewed renewal. 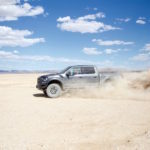 Firing on all cylinders, we quickly deconstruct camp and load the Raptor. 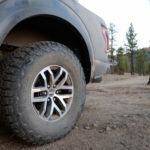 We’d planned for an early return, but the truck practically begs for a last minute adventure. The unbridled animal churns the earth, sending plumes of dust across the dry ground, Barreling up a hillside was fun, but this is ecstasy. 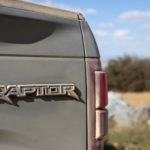 My companion braves the mortal heat to snap photos of the Raptor at play. Reviewing the images later, I appear to be cackling with laughter from behind the wheel. Don’t judge – you would be too. 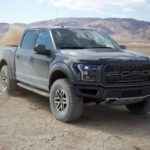 It’s clear the Raptor could kick sand all day, but the sun eventually saps the last of our energy. 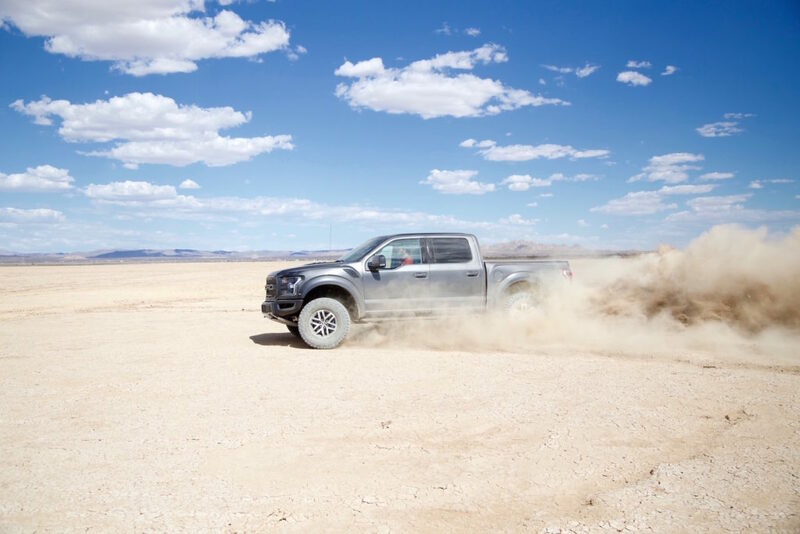 Triumphantly, the pickup skips along the lakebed before rejoining paved roads. It’s an hour and a half journey home – plenty of time to be grateful for my bad habit.